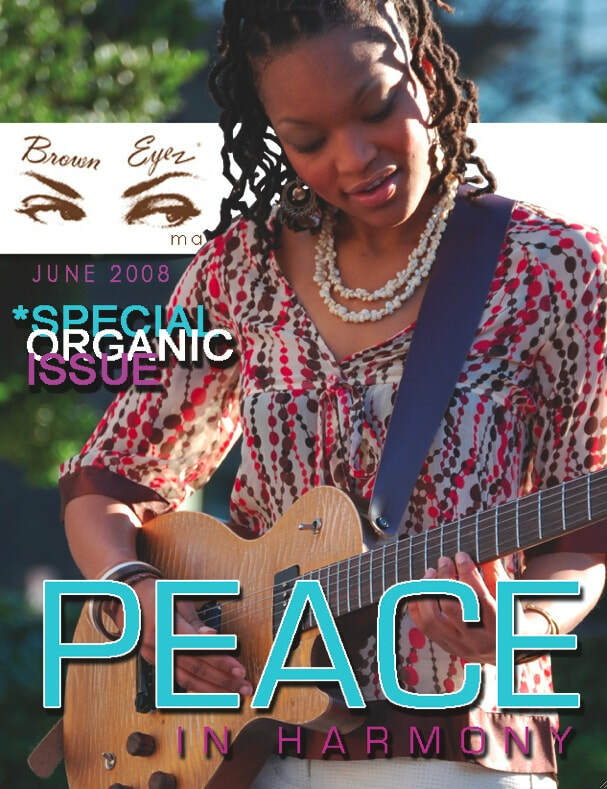 B-E-M: I love the name "Peace" for you, how did you come up with that name/how was it given to you? P: Thank you! The name Peace was given to me by my mom. She used to like the music group WAR, and what they stood for back in the day. The two names/words have completely opposite meanings, but she felt that Peace would be an appropriate artist name for me because of what I’m about, and the message that I bring. B-E-M: How do you define healthy living and how does music play a part in your definition? P: I feel that there should be a holistic approach to healthy living. That includes being mentally, spiritually, and physically healthy. Healthy is not just looking good on the outside; it’s about feeling fulfilled in your mind, body, and soul. Music plays a tremendous role in my definition of healthy living because I produce, write, and perform music that comes from my soul. The lyrics I write are encouraging, truthful, and uplifting. Music is medicine and it’s extremely powerful that’s why I choose not to use profanity or derogatory lyrics. Whether or not artists want the responsibility, we all are role models and examples to everyone who listens to us and take in what we put out. For example, someone could hear a line in a song that changes his or her entire life in a positive way forever. B-E-M: What are some things you do in your life to stay healthy? P: Drinking lots of water and consistently exercising are the two main things I do in my life to keep myself healthy. I also don’t eat beef or pork; I have not for about 3 years now. I have also reduced my meat intake; my goal is to only eat chicken (for protein purposes) once a week. Another goal of mine is to not eat heavy meals after 9:00pm; if I’m hungry, salad and fruit are acceptable. B-E-M: I love your message and the way you carry yourself, Peace, how important is it to be positive onstage as well as off stage? P: It’s extremely important to be positive both on and off stage. I personally believe that I should be more of what I want to see in the world. Whatever I put out is inevitably come back to me, so I try to be compassionate, non-judgmental, patient, kind, and loving. Artists are role models on and off stage; keeping consistency in your life creates balance and eliminates confusion. B-E-M: What are some ways you take care of the earth, does this play a role in your personal and professional lifestyle (i.e. not using to much energy, recycling). P: Recycling, preserving water, trying not to drive a lot are a few of the actions I do to take care of the earth. For example, every time my family and I use products that are able to be recycled, I make collections of all of it so that it can be recycled. When I shower, wash dishes, wash my car, etc… whenever there’s water involved, I try to be mindful of how much I need to get the job done and how much I’m wasting. I try to drive only when it’s necessary to preserve energy and not put a lot of harmful rays into the atmosphere. B-E-M: Hailing from ATL, how has being a Southern Woman influenced your music? P: Being a southern woman has heavily influenced me personally and my music. Growing up in the south has built my character and made me strong because of the challenges that I’ve had to face. I have had to witness and experience situations that were completely unfair. It was all necessary and humbling, and I don’t regret anything. One of the biggest lessons that I’ve learned is if I see someone acting a certain way or doing things that I don’t agree with, I purposely try to behave in a manner that is completely opposite of that. It’s like they teach me how NOT to behave. My music is influenced because it’s an outlet; whatever touches me and pushes me to write is expressed in my music. B-E-M: My favorite song of yours is “It's Time.” What is the message behind this song? P: The message behind It’s Time can be interpreted in a number of ways. When I use the term Babylon, I’m speaking on all types of impurities. For example, there is a lot of corruption and destruction/self-destruction going in this world. There is a lot of violence, there is a war going on, there are people involved in abusive relationships. My message in this song is to let people know that anything impure they’re dealing with can and will end once ALL faith is put into GOD. Anything that anyone is dealing with can be healed, cured, and straightened out by God’s love and power. P: Positive music and artists have the opportunity to cure a lot of issues that are occurring globally. There a lot of the same issues happening all over the world. With the Internet being so powerful, people in numerous countries have access to music all over. A positive song could come on at just the right time and in just the right moment that could cure an issue that someone is dealing with. Now that person is able to share their healing with people they come into contact with. Positive music has great opportunities to cause positive chain reactions, and that’s what it’s all about. B-E-M: What do you want people, especially the Black community, to get out of your music? P: I want all people to first and foremost understand that God is in control, and once we begin to walk in faith and relinquish control to God, our lives can begin to blossom and take off in ways that we could have never imagined. I want the black community to understand that it’s okay to speak correct English and be professional. To all black females, LOVE AND RESPECT yourselves! You can’t expect anyone to do those things for you if you don’t do that for yourself. Black males LOVE AND RESPECT our women and yourselves. Another piece of advices I want to give the black community is to learn your history. Once we understand ourselves and where we came from, we can then become unchained. B-E-M: Are you involved with any community service projects? P: I am consistently involved in community service projects. I do the majority of my community service work with the Auntie Karen Foundation and DRAMA. These are two non-profit organizations that I’m involved with. They do a lot of empowering things that encourage our youth to participate in programs that educate, enlighten, and keep them out of the streets. For example, I donated a song to the Auntie Karen Foundation for her TV pilot with ETV involving her puppets. I have also been to schools and after school programs with both of these organizations and spoke and shared my songs with our youth. B-E-M: What are your future plans? P: My future plans are to keep growing and developing my crafts and myself. I also plan on putting out the messages that I receive through the art of music with the intent to create a national as well as international awareness. I plan on contributing, sharing, and learning more with the universe everyday!